3 similar, but commercial programs. and not the whole truth. This program does waste more RAM than it gives you back..."
of this kind of programs in case you decide to buy one. a company that has other products also, not only 1 memory optimizer, you can be 100% sure you are not left alone if you have problems. the program gets better and better all the time. resources than it used to. Also the developers of XXXTurbo try hard BUT I just made some tests with their new version and I am sorry to say that even if it uses less memory than it used to, it still uses much memory, even if sitting in the tray, and when visible, uses the CPU heavily. Their problem is the "Tabbed Notebook" structure of the program. The "tabbed notebook" eats a lot of memory if you don't exactly know how to avoid that. There is a cure for this, and I hope they fix this, because actually XXXTurbo is "The Mother" of all this kind of programs. Another problem of XXXTurbo is the heavy graphics used. This eats a lots of system resources (gdi and user) and causes cpu-readings to go wild. The resource usage is 4% and this is TOO much. If you are into nice looking interfaces etc. this one is your choice. The program looks really nice. My suggestion : Less graphics and fix for the Tabbed Notebook-problem makes this program Rock'n Roll. XXXMemPro has the very same problem with resources than XXXTurbo. 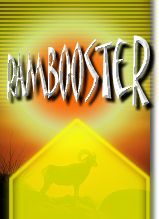 commercial product support and updates, buy Win-RamBooster. (TaskInfo 2000 available) Worth downloading, it is an excellent program. Also other programs were used to monitor the values.